FLASHBACK TO 2012. Watch the book trailer for Living Underground, produced by Empty Cup Media. READING. November. WCDR’s “Bookapalooza“, Durham College/UOIT Campus Recreation and Wellness Centre, Oshawa. BOOK CLUB VISIT. October. Living Underground book club meeting in Virginia. “WORDS OF THE SEASON.” September. Durham Region and WCDR Culture Days event in Pickering, Ontario. MUSKOKA NOVEL WRITING MARATHON. July. Novel marathon in Huntsville, Ontario, where forty writers raised money for YMCA Literacy Services. Ruth won the MNM’s “Best YA Novel” Award! TWUC CONFERENCE. May. Flew to St. John’s, Newfoundland with friend and colleague Ted Barris to attend the OnWords conference and the Annual General Meeting of The Writers’ Union of Canada. Visit Out & About page for photos. WRITERS CONFERENCE. May. Attended the Ontario Writers’ Conference in Ajax, Ontario and offered insights and feedback in the Blue Pencil Sessions. RETREAT FACILITATOR. April. Co-facilitated Writescape’s “Spring Thaw” writers retreat at Elmhirst’s Resort, on the shores of Rice Lake. AA BOOKSHELF 2013 LIST. Living Underground was featured in the electronic version of The Bookshelf 2013: A catalogue of books by members of the Canadian Authors Association. Published on the ISSU platform, the catalogue is available to an international audience. GUEST AUTHOR. December. At the Writers’ Community of Simcoe County luncheon. RECOMMENDED READS LIST. December. Open Book Ontario selected Ruth and Living Underground for their “Focus On: Durham Region – The Recommended Reads” list. INDIE BOOKSELLING DAY. November. Blue Heron Books, Uxbridge, Ontario. WRITING RETREAT. November. Writescape.ca‘s “Turning Leaves 2013” writing retreat on Lake Couchiching in Simcoe County, with guest author Bill Swan. BOOK CLUB VISIT. November. Clarington Public Library Book Club, Bowmanville, Ontario. WORKSHOP. October. “Your Character’s Voice” creative writing workshop, Central Library, London, Ontario. INTERVIEW. October. Print interview “Between the Pages” with Christopher Reeves on “Smell the Book” blog. LIVING UNDERGROUND BOOK TOUR CONTINUES. October visits with two different books clubs in Ottawa. WORKSHOP. September. 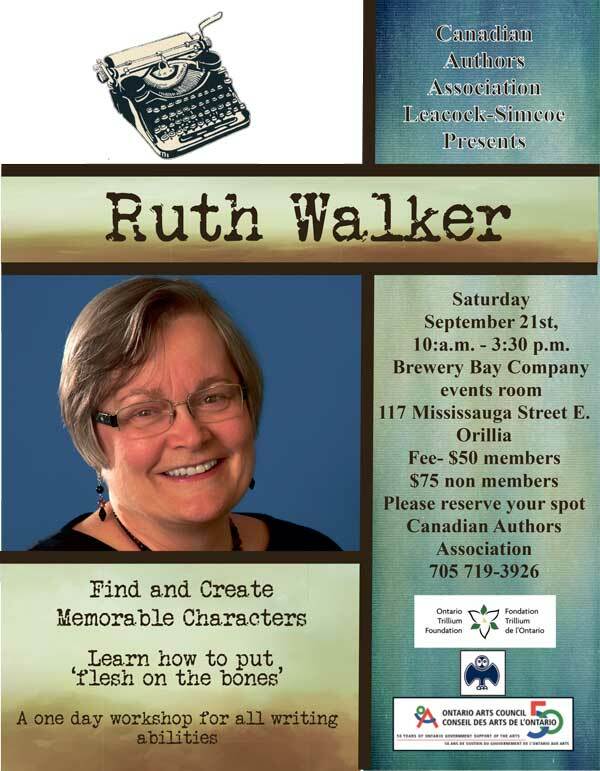 “Find and Create Memorable Characters” in Orillia, Ontario, offered through the Canadian Authors Association-Leacock Simcoe branch. READING. July. JUzDIzRTS author event at Covernotes in Richmond Hill. READ LOCAL. Living Underground appeared on The 100-Mile Book Diet map on 49th Shelf’s website. READING. June. More2Life4Women magazine’s first “Summer Solstice Open Mic” event in Whitby, Ontario. BOOK TOUR. June. Living Underground toured southwestern Ontario and continued into the U.S. Talks and readings included Oxford Book Shop in London, Ontario and FAUSA in Birmingham, Michigan. MONTREAL POETRY PRIZE LONGLIST ANTHOLOGY – “Gilt” was included in the anthology, on page 76. U.S. BOOK CLUB READING LIST. Living Underground was added to the Book Club Reading List, “from which book clubs can schedule the author to attend their meetings. APPEARANCE, February. With Farzana Doctor, Scott Fotheringham, and others, at the LitLive Reading Series in Hamilton, Ontario, at the Homegrown Cafe at the SkyDragon Centre. RADIO INTERVIEW. On Canoe FM‘s Arts Week, hosted by Mark Arike, filling in for regular host Jack Brezina, aired in February 2013. PRINT INTERVIEW. Michael Bryson’s January interview with Ruth on The Danforth Review website. E-BOOK EDITION. Living Underground available as a Kindle e-book. Order from Amazon. SECOND PRINTING. Living Underground went to a second printing in January 2013. ARTICLE. “Author Inspired by Highlands” appeared in the December 27, 2012 issue of Haliburton County’s The Highlander. IN YOUR LIBRARY? Living Underground arrives in local libraries, including Toronto Public Library (click link to read catalogue entry). Inquire at your local branch for Living Underground. LIVE INTERVIEW & READING. November. Whitby Central Library hosted “Cracking the Mystery of the First Novel” with guest authors Ruth Walker and Allison Baggio. They were interviewed by fellow author Ingrid Ruthig. BOOK CLUB NEWS. Visits to book clubs that have chosen Living Underground for their members to read, including various Toronto locations and in Durham Region. Ruth will travel and/or use Skype, telephone or email. Contact her directly. RADIO INTERVIEW. 107.1 FM WhiStle Radio in Whitchurch-Stouffville broadcast interview with host Catherine Sword on “Shelf Life” in November and December. Click here to listen online – scroll to “Past show archive” and click “November 27, 2012 Author Interview with Ruth Walker , or click these links for a direct link: Part 1 Part 2“. BARRIS BEAT MENTION. November. Accomplished author, journalist and broadcaster, Ted Barris, writes about Ruth and Living Underground in his post “And the winner is…” on his blog Barris Beat. TWUC MEMBERSHIP. Visit Ruth’s Writers’ Union of Canada profile. DEBUT NOVEL. Living Underground, published by Seraphim Editions launched in Hamilton on September 29, in Toronto on September 30, and in Durham Region October 14, 2012. Visit the Living Underground page. ARTICLE. September. “This book really is hot of the presses” by Christy Chase in DurhamRegion.com. RADIO INTERVIEW. September 16, discussing her novel on Mohawk Radio 101.5 FM (Hamilton), Ruth chatted with host poet Bernadette Rule on “Art Waves”. To listen, click link. MINI WORKSHOP. February. Through the WCDR, “What I Learned About Shameless Self-Promotion as a Debut Novelist”. INTERVIEW. June. Dale Long’s interview, about writing and Ruth’s upcoming novel, on Inkstroke’s “The Author’s Voice“. “THE BUTTERFLY EFFECT”. May. Ruth’s post on The Haliburton Highlands Land Trust website. CCWWP. May. Canadian Creative Writers and Writing Programs 2012 conference in Toronto. MASTER CLASS. May. Creative nonfiction at CanWrite! Canadian Authors Association (CAA) conference. TV APPEARANCE. January. Durham Region Rogers TV show “Daytime”. ANTHOLOGIES. Poetry featured in two a nthologies: Being Unquiet (shown here) and Tuesday’s Child launched in December. Copies available from the publisher, Piquant Press. LONGLISTED. Poem on longlist of the 2011 Montreal Poetry Prize. TV APPEARANCE. Rogers Cable TV’s “Daytime” with Christian and Julia, about being creative with writing. GUEST SPEAKER. Writers’ Community of Simcoe County (WCSC) about “Luck, Stupidity and the Bliss of Ignorance: The Wins and Losses of a Reluctant Writer”. PERFORMANCE. Joined acclaimed percussion quartet TorQ at the Haliburton Forest Festival. TorQ’s show, “The Call of the Drum”. Ruth’s poem “Water Dreams” was also performed as an interpretative dance. HAIKU SET TO MUSIC. Along with 16 others, as part of the Great Canadian Haiku Contest. The winning haikus were set to music by Hawksley Workman, Royal Wood, Emm Gryner and Catherine McInnes, and performed on a workshop stage at the 2011 Home County Folk Festival. The workshop was recorded and streamed live by 94.9 CHRW in London. PERFORMANCE. Choreographed performance of excerpts from her poem “Water Dreams” before an audience of 600 students and staff at Durham Integrated Arts Camp in Haliburton. A dozen young dancers from the advanced class moved to selected lines from Ruth’s poem while she read from the stage. TEACHING. Durham Integrated Arts Camp (DIAC), where Ruth taught creative writing to regional youth. POEM SELECTED. A #5 spot in the top ten in Robert Lee Brewer’s poetry blog challenge for Writer’s Digest. To read the winner, “Oak Harbor, Ohio” by Brett Elizabeth Jenkins and see the list of the top ten that includes Ruth’s. INTERVIEW. Featured in the May 2011 issue of Markham Village Writers. WRITESCAPE FEATURED. Ruth and Gwynn’s 2011 ‘Spring Thaw’ retreat featured on CHEX TV’s Newswatch. Watch clip below. LISTING. In the Poets & Writers’ Directory of Writers online. AWARD. An education grant from the Writers’ Community of Durham Region. To learn more, visit the WCDR’s website. UTNE READER, a U.S. guide to alternative and independent press, featured Ruth’s story “Death in the Family” (which won an honourable mention in Geist‘s postcard story competition last year) in its Library Crawl series. Read “Close Reading: Trolling the Utne Library“. CONNECTING. Ruth is on Facebook and Twitter. INTERVIEW. Open Book Ontario’s “Get to Know Literary Ontario“. GUEST FACILITATOR. Discussion about Rabindranath Maharaj’s first novel, Homer in Flight, facilitated with colleague Ingrid Ruthig on Reading As Writers. WORKSHOPS IN QUEBEC. November. Ruth facilitated a two-day immersion Writescape workshop (among others) with Gwynn Scheltema in the Pointe Claire area. POEMS. A suite of poems was published by Scotland’s Chapman literary journal, Issue #110. INTERVIEW. On York Region Rogers TV about her “Write to Win” workshop (with Dorothea Helms) in Aurora. NEW BOOK. Creativity book Inspiration Station. 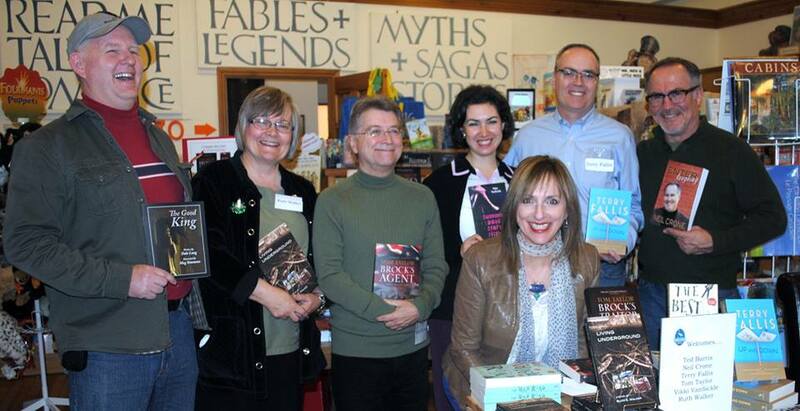 The official launch took place at Blue Heron Books in Uxbridge, Ontario. Click cover for more info about the book. WORKSHOP. Writescape’s ‘CREATIVE COMMUNICATORS’ was offered to the Ontario government. RETREAT. Sage Hill Writing Experience, where she workshopped her fiction in the ‘Fiction Colloquium’ with novelist Catherine Bush. GEIST HONOURABLE MENTION. Postcard story competition for “Death in the Family.” To read the story, click http://www.geist.com/postcard-story/death-family. View the list of winners. AT CAMP. ‘On assignment’ at DIAC – Durham Integrated Arts Camp – where she fostered creative writing skills among students. ANTHOLOGY. Edited the Writers’ Circle of Durham Region’s anthology Wicked Words, which features the prize-winning writing from the competition. GUEST VISIT. At Uxbridge Senior Scribes writing circle. Watch Ruth discuss writing in the new millennium with Ted Barris and others at http://www.youtube.com/watch?v=2KQQpRN4dYM. LONGLISTED. “Death in the Family”, a postcard story, was longlisted for Geist Magazine‘s 6th Annual Literary Postcard Story Contest. One of 15 entries chosen from among 531, it appeared online at Geist. PARTICIPATING WRITER. And editor, at the annual 2011 Ontario Writers’ Conference. PANEL DISCUSSION. “How to get published in the New Millennium”, recorded before a live audience, was moderated by Ted Barris and produced in conjunction with the WCDR, TV broadcaster Garth Riley, and Avtel Media. A second discussion of traditional publishing vs. self publishing in the digital age was also recorded. Both aired online. GRANT. An Ontario Arts Council grant through their Writers’ Reserve programme. DIGITIZED WORK. At the Poetry Library, Southbank Centre, London, UK. Her poem “Mothers Song”, from issue 7 of Rain Dog was included in the digital library website (www.poetrymagazines.org and www.poetrymagazines.org.uk). RETREAT. ‘Turning Leaves’ all-inclusive Writescape Writing Retreat in the Kawarthas. POEM. “Lucy’s Bones From Afar” appeared in The Science Creative Quarterly, Issue Four, 2009. WORKSHOP. As part of the Mariposa Writers’ Group annual festival, Lake Country Literary Lapses, Ruth offered a morning workshop, focussing on short fiction and targeting Great Beginnings and Awesome Endings. READING. With Bill Howell at the Hot-Sauced Words Poetry Performances in Toronto. POEM SELECTION. “If I Never Heard or Saw a Frog Again” was chosen by Bob Johnson, Curator, Amphibians and Reptiles at the Toronto Zoo to include in the newsletter Amphibian Voice. He was “touched” by the poem’s “simplicity and insight” and asked permission to also reprint it with the next edition of the frog call CD for their Adopt-A-Pond wetland conservation program. READING. “Narrative Landscapes”, a collaboration of the Writers’ Circle of Durham Region and the Oshawa Public Library, offered an evening of short story readings by locally-supported authors. POEMS. Invited to contribute to a collection of poetry for the Canada Cuba Literary Alliance anthology from the summer’s joint international reading event. READING. At the Oshawa Public Library’s Northview Branch, Ruth read with novelist Elizabeth Ruth, OPL’s writer in residence, who shared the spotlight with some of the writers she worked with during her recent residency and workshops. NATIONAL MAGAZINE AWARDS. Prairie Fire magazine nominated Ruth’s poem, “The Doctor Drowns in Bertioga, Brazil, 1979” for a National Magazine Award. The poem also took third place in the Bliss Carman Poetry Award competition.